OK, so I have been having a small obsession with knitting hats... I have made three hats this month (and by this month, I mean April which was actually a couple of months ago)... One of them in just one weekend!!! 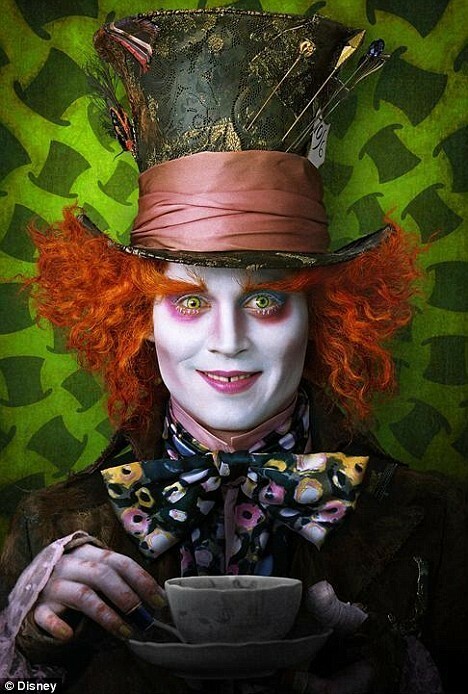 My favorite Mad Hatter: Johnny Depp is just so cool. If you haven't watched Tim Burton's Alice in Wonderland I suggest you go and treat yourself. So I made a hat for my nephew for his 21st. My son was lucky enough to be the hat model. He so liked the hat, he requested one for himself. I was happy to oblige and then came to the sick realisation that this is the first garment I have knitted him since he was baby. I felt slightly ashamed to call myself a mother who knits. However, this was balanced by the fact that something I had knit was considered a cool enough clothing item to be coveted. Here is the boy modelling his cousins hat. And here is the boy modelling his own hat. I made this from the same op shop wool from which I made the homework help pouch for a baby kangaroo. It's such a cool neutral-ish colour and can come across as a dirty cream, a light grey or a fawn-ish brown depending on the lighting and what clothing your pair it with. I finished this in time to call it an Easter present. There were some really bad taste jokes running around that we had turned the Easter Bunny into a hat. Needles: 4mm dpns (actually they are still labelled as size 8 - antique jumper length Aero dpns). I love these needles for knitting hats. And only $2. Best op-shop buy ever! Yarn: 8 ply op shop sourced homespun fairly greasy wool with some flecks of other fiber. Cost about 50 cents per 200g or about 50 cents per hat. So there was nothing for it but to immediately cast one for a second hat. Surprisingly, it wasn't any hardship to knit the exact identical article twice in a row (The first time in my entire knitting life that I have down this). It was even fun. Twin hats drying in front of the heater. So now I was two hats down but I have, in fact, three children. OK, you don't have to be a mind reader to predict what is coming next. Mel, the middle daughter was pushing for it to be her turn. 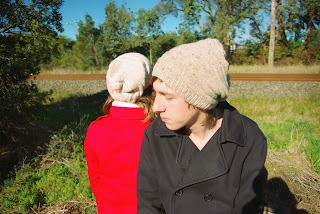 But not an identical beanie. She already had her eye on a cute little owl head hat from Simply Knitting issue 100. Pattern: From Animal Hats by Rachel Henderson via Simply Knitting Issue 100. Needles: Set of two 4mm needles. Yarn: Cleckheaton Country in cream (1 ball - sourced from an op shop), Cleckheaton Country in Beige (Seconds from the Australian Country spinners Wangaratta Woolen Mills, a present from my mother after a recent trip there - she knows what it takes to make me happy) and the orangey mustard is aran weight wool from the stash which is so old I have no idea of it origins. So I knitted this up in a weekend and had a ball doing it. Its so much fun to watch the face building up row by row. This classified as one of those "just one more row" knits, perhaps explaining why it took so little time. And here is the owl hat in its natural environment. Wow you're a hat extraordinaire! I hope my son (now 4) covets my handknits when he's bigger - that's a big compliment! Thanks. Hope you boy turns out to be as much of a pleasure to mother as mine has been generally. Keep tuned for more on hats. This was just the start of a strange obsession or possibly addiction.